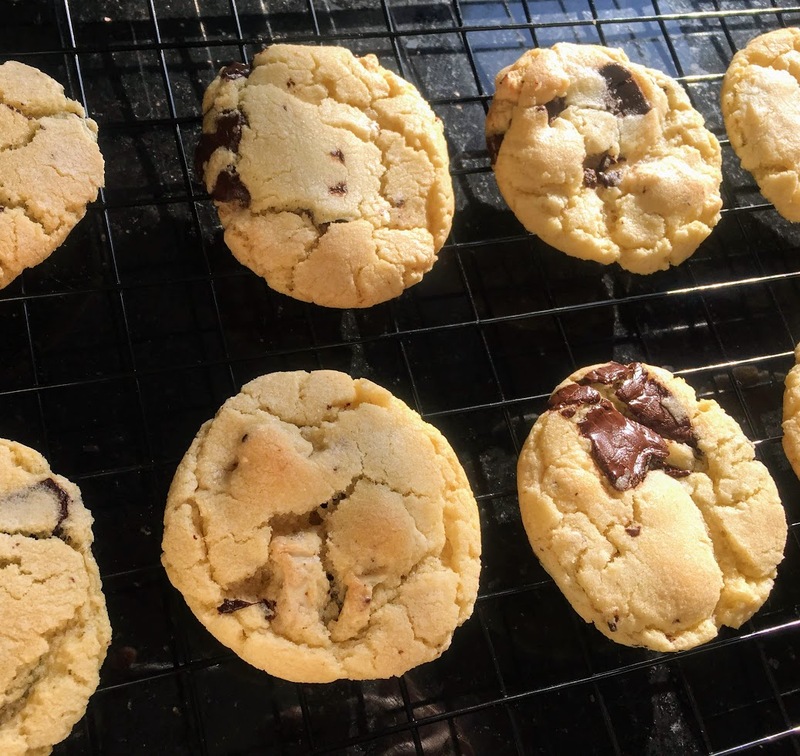 Crisp on the outside, gooey in the middle, with pools of melted chocolate, these have all the best elements of a classic chocolate chunk cookie, with a twist: sea salt is added to the dough and also sprinkled on top before baking. The original recipe, from the Smitten Kitchen website, calls for using bittersweet chocolate and three types of sugar – turbinado, brown, and granulated – for added texture and flavor. Over time, I made a few adjustments, swapping half the dark chocolate for high-quality white chocolate (I use the brand Green & Blacks,) and using only granulated sugar. I began doing the latter out of convenience, since my pantry isn’t always stocked with brown and turbinado sugar, but found that the simplicity of the granulated sugar allows the taste of the butter and chocolate to really shine through. The result is somewhat similar to a sugar cookie, with bursts of flavor from the sea salt and two types of chocolate. Easily prepared in one bowl, it’s my go-to recipe for weeknight dessert cravings. Note: For a richer, toffee-like flavor, replace most of the granulated sugar with brown sugar. Use 3/4 cup plus 2 tablespoons brown sugar and 1/4 cup granulated sugar. Preheat oven to 360 degrees F and line a baking sheet with parchment paper. In a large mixing bowl, with a wooden spoon or hand-held mixer, cream butter and sugar until light and fluffy, around 3-5 minutes. Stir in egg and vanilla until smooth. Add baking soda and sea salt. Mix in flour until just combined. Stir in white and dark chocolate chunks. Roll heaping tablespoons of dough into balls and place at least an inch apart on prepared baking sheet. Sprinkle each cookie with a pinch of sea salt. Bake for 11-12 minutes, until golden brown around the edges but still gooey in the middle. Let cool on the baking sheet for 5 minutes, then transfer to a cooling rack. Store at room temperature in airtight container.